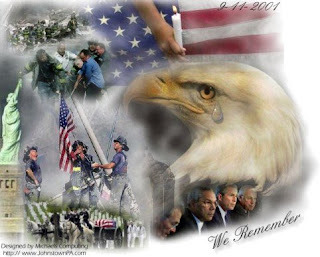 I still remember sitting at work that morning and hearing on the radio that a plane had hit one of the twin towers. At that time they were assuming it was a small commuter plane and it had nothing to do with a terrorist attack. We sat there, ears glued to the radio for more news, and wishing we weren't being interrupted by costumers! 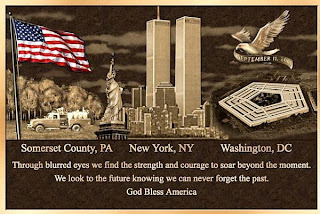 (I was working at a bank drive up at the time) It was a very strange feeling as the details came out, realizing our country was not as safe as we had though, and seeing just how vulnerable we were! Today, it's good to remember that even if we don't understand it, God is in control. May we never forget that! Yeah, I agree...people tend to forget pretty fast, even with the huge impact it made on people at the time.